For her last challenge of the month, Vicky picked one that is very close to my heart -- FUN FOLDS! I love doing fun folds, so I was so happy to comply. I used a technique I've only done once before -- a panel pull-out card. Be sure to check out some more fun-fold cards on the CCEE Stampers blog. 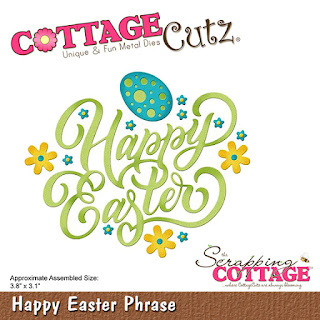 Today is my final opportunity to show off an Easter card on the CottageCutz blog. I used one of the dies from the Spring/Easter release, as well as a basic shape die I recently acquired -- the Nested Wacky Stitched Rectangles. To start my card I cut the Spring Basket images from a piece of white cardstock and placed them on my sticky board. For some reason they look blue on this photo; but please believe me, they are white. Using some Copic markers, I colored each one of the pieces. The packaging shows the basket all in one color, but I wanted to make it look a bit more realistic. 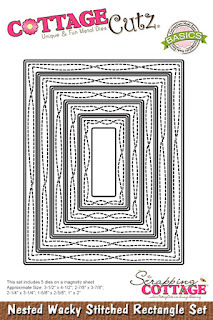 White cardstock - 8 1/2" x 5 1/2"
Purple cardstock - 4" x 5 1/4" and 3" x 4"
The pale purple cardstock was cut using the second largest Nested Wacky Stitched Rectangle die. I layered the patterned paper on the larger purple rectangle and adhered them to the white card base. Then I assembled the die-cut pieces onto the pale purple die-cut piece and adhered it to the smaller purple piece. This was then attached to the card base using large foam pop dots, and a small Easter greeting was stamped in the corner. You can see how these foam dots, as well as the ones behind the chick and tan bunny, give the card some dimension. The other 2 1/8" x 11" strip of brown cardstock was scored as follows: 7/8", 3 5/8", 4 1/8", 6 7/8", 7 3/8" and 10 1/8". I adhered panels of patterned paper to the "front" panels of this inner strip . 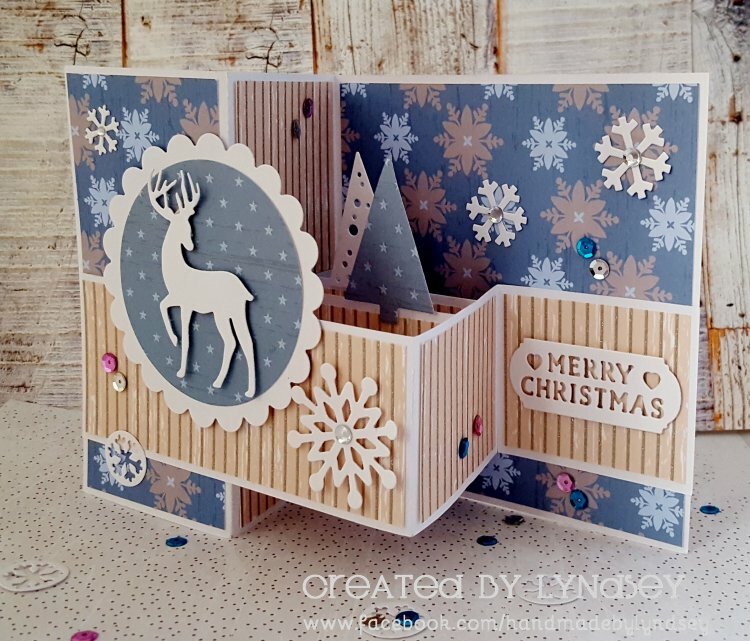 . .
Vicky has a fun challenge for the CCEE Stampers today. She's celebrating National Goof-Off Day. She says it's one of her "favorite days evah!" She asked us to make a funny card . . . any kind of card, just so that it's funny. I hope my card is funny enough for her. For some more humor, be sure to check out the CCEE Stampers blog. 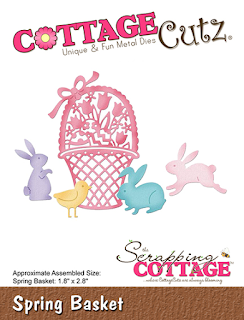 CottageCutz's Spring/Easter release has lots of cute dies. I'm using three of them on my card today -- Happy Easter Phrase, Miss Petunia Bunny, and Spring Meadow. Before I explain about my card, I first wanted to remind you that there is a 25% discount sale on the newest Rise and Shine in the CottageCutz store, with lots of cute breakfast and cooking dies. Be sure to check them out while the sale continues. Before cutting out the dies, I put a sheet of two-sided adhesive on the back of a piece of white cardstock to make adhering the smaller die-cuts easier. To tell the truth, I waver back-and-forth between using the adhesive sheets and not. Either process will work well if you have a fine-tip applicator on your glue for when you don't use the adhesive sheet. After cutting out the pieces, I colored them and constructed each element. I used a black mini brad for Miss Petunia's eye. Sky patterned paper - 4" x 5 1/4"
Brick patterned paper - 4" x 1 1/2"
I then constructed my card base, adding the "Happy Easter" phrase. After slipping Miss Petunia between the rows of grass, I placed the egg on the wall, and stuck the flowers (from the Happy Easter Phrase die) to the stems within the grass. I tend to work "by the seat of my pants" and realized that the phrase didn't really stand out as much as I had envisioned, so I pulled out my Dark Green Wink of Stella brush and went over the lettering. I was much happier with the result -- it now glitters! This week Vicky asked the CCEE Stampers to celebrate St. Patrick's Day a bit early by making a card indicative of the holiday -- either a St. Patrick's Day card or one with green as the focal color. My Irish ancestors would not forgive me if I didn't choose the first option. I used a technique I haven't done in a while -- Retiform. 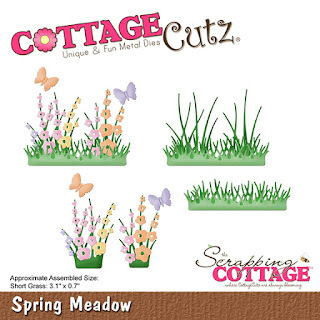 If you've never done this fun technique, here's a tutorial from Splitcoaststampers. Be sure to visit the CCEE Stampers blog for some more green. I was so excited when asked if I would guest design for this new set from Kindred Stamps -- Students of Magic. It is a re-design of Wizard Friends, which I absolutely loved. But I have to say, this new set blew my mind. I went to work as soon as I received it in the mail. I'm going to wear out those stamps if I'm not careful. I have six cards to show you. The first card is a favorite technique of mine -- Triple Stamping. I used two of the smaller images, stamped multiple times; but the focus of the card is the sentiment. It could be a philosophy for all of us to follow! My next card is relatively clean-and-simple. I was so happy with all the additional characters included in this new stamp set. I used one of the additional characters (as well as the bespectacled guy!) on this card. I am sending this next card to my niece, who is a fan of the little lady with the big glasses. I hope she enjoys my card. I borrowed a sentiment from the Kindred Stamps Royal Throne set for my next card. It worked perfectly with these two red-headed twin brothers. 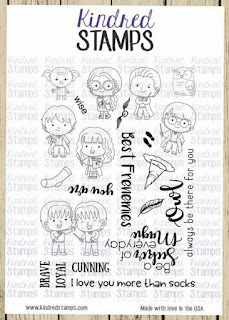 I loved that the shoe prints were included in this stamp set. Mmmm! I may have to make a card with a map on it. We have a little bonus this month. Kindred Stamps has a digital image called Magic School, which coordinates with Students of Magic. I wanted to make a card spotlighting this digital stamp. My final card uses Spellbinders Labels 7 die set, which I use whenever I want to make a card with a "book" on it. I thought I had some socks patterned paper; but, when I went to look for it, the paper I was thinking of was actually flip-flops. So I had to Google "socks" to print out the background paper. I hope you've enjoyed what I did with this super 6 x 8 Students of Magic set. 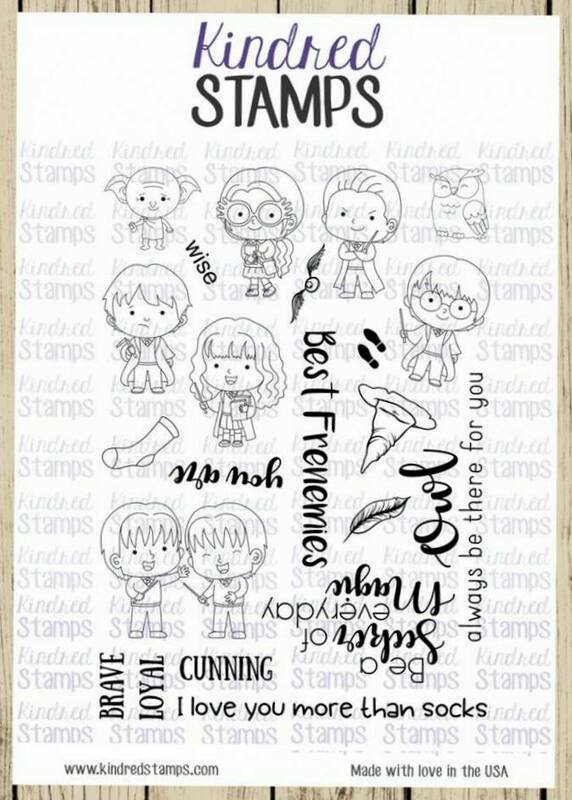 Now, you get to go visit my friends on the Kindred Stamps March Release Blog Hop! We have 7 stunning sets for you to enjoy this month and believe me, several are on MY wish list. I can't wait to hear which you love and must have. Make sure you leave a comment on each blog to be entered into the drawing for a $10 Kindred Stamps store credit! When you leave a comment, please also include your email address so we can find you easier, you can do so in an email (at) address dot com format if you prefer! The winner will be messaged and announced in our Facebook Fan Club! 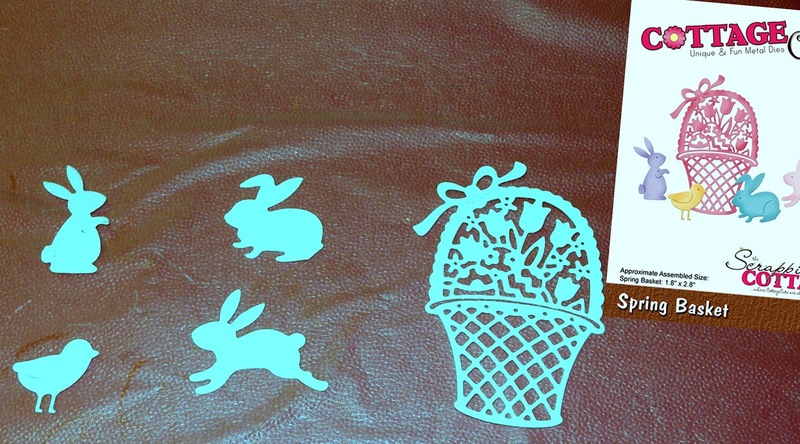 Easter is just a few weeks away, so for today's CottageCutz blog I made an Easter card. I had bought a pad of patterned paper a few weeks ago at Hobby Lobby that had several pieces that looked just like a woven basket, and I've been wanting to use it. Today is the day! My card, using one of the Spring dies (Spring Flower Eggs), is pretty simple. To start, I cut the eggs three times -- from yellow, pale green, and purple cardstock. 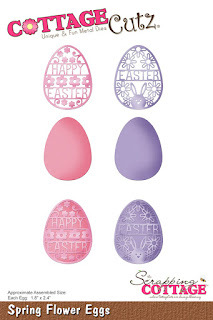 Using a fine-tip glue applicator, I glued the cut-out eggs to the solid back pieces, alternating the colors. 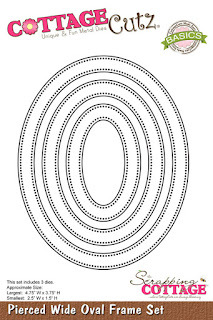 Cream - 8 1/2" x 5 1/2"
Patterned paper - 2" x 5 1/4"
The handle was cut from tan cardstock, using the largest CottageCutz Pierced Wide Oval Frame die. Using a wide-angle corner punch, I rounded the bottom corners of the basket-weave patterned paper. I wrapped some purple ribbon around the oval frame/basket handle, taping it in place. I taped the handle to the back of the basket and added the eggs. Then I adhered some foam tape strips around the basket and the frame. Removing the protective paper from the tape, I adhered the basket to my card base. I added a large foam pop dot behind each egg and a strip of ribbon and bow to the basket, and my card was finished. 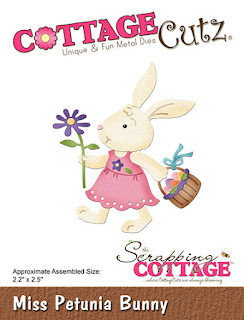 By the way, CottageCutz has a new release of some cute breakfast items called Rise and Shine. They are currently on sale at 25% off. Be sure to check them out.